Early bird discount of 20% Pre book Now!! Ram is revealing what would take years to learn for students and graduates in one punchy, practical book. It’s a powerful manifesto for the next generation of designers to demand the best from themselves. As someone who struggled for two whole years to break in to my own creative career, I applaud Ram for sharing these vital tricks of the trade. I wish someone had been good enough to give me an insider’s guide like this when I was starting out! 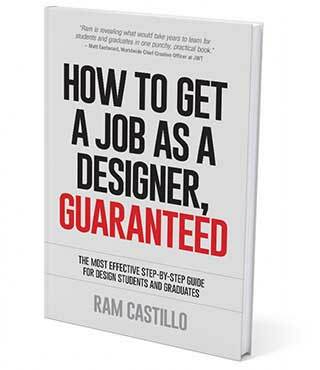 I congratulate Ram on an excellent guide for anyone aspiring to a career in design. It distills years of hard earned experience down into concise and practical advice on how to package, polish, promote and profit from your talent. Crucial design principles to apply that will raise your standard to a higher professional level. Creating your portfolio quickly and easily, the right way and establishing your personal brand. Meeting decision makers, getting them to respond and leveraging people effectively to create job opportunities. As they say, it's not what you know but who you know. Learn how to be ready for any question and find the secret to standing out. The book is packed with motivation and inspiration to nurture important values. It highlights what Creative Directors are really looking for when hiring. This book comes in both paper back and eBook versions.It aims to cater for all types of readers and their preferences. 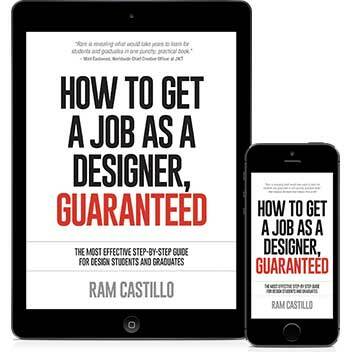 'How to get a job as a designer, guaranteed' is widely available from over 300+ online book stores (including Amazon, Barnes & Noble and Book Depository), who will deliver your paperback book safely to your door or instantly as an eBook (for example via iBookStore for your iPad, Google Play for your Android Tablet or Amazon for your Kindle) to your device. I have Ram to thank for helping me earn a position at a top-notch marketing firm. He taught me how to think like a designer and present myself like a businessman. I cannot thank him enough. 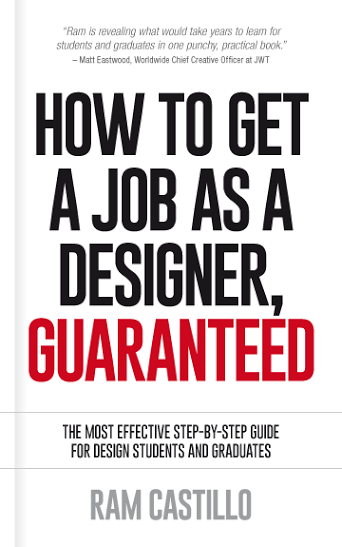 'How to get a job as a designer, guaranteed' provided me with the insight it took for me to live my dream career as a designer, I wouldn't have taken the leap without him. The dilemma is, you need experience to get a job but you need a job to get experience. So how do you stand out in a world full of noise and an overwhelming amount of competition? 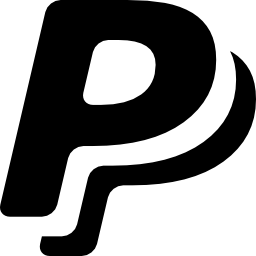 After graduating over 12 years ago, I first started in the mailroom of an advertising agency. There was no practical and direct resource to help me get a job. I had to figure it out myself. So coming from this perspective, I know that students and graduates all over the world are hungry for practical guidance, inspiration and mentoring. In 2012, I started a blog called giantthinkers.com which helps design students and graduates be employed. After working for globally renowned agencies such as Ogilvy & Mather, DDB and McCann Worldgroup on clients such as Audi, Telstra, Qantas, Commbank, Westpac, Crown and the Louis Vuitton Group, I'm now able to give back to the industry which has given me avalanches in return. The blog then became the seed of releasing my first book which is available to you on this website. It's the culmination of everything I've learned to get hired and it's my pleasure to reveal my proven strategy to those that are serious about fast-tracking their entry into the design world. Copyright © Ram Castillo 2014. All rights reserved.